As a travel writer who is married to a farmer and lives on a farm in central Illinois, it is always fun to see other parts of the world and learn about different things. While many of the publications I write about include antique tractors, farm toys and agriculture, since 2012, I have been adding a focus on travel. 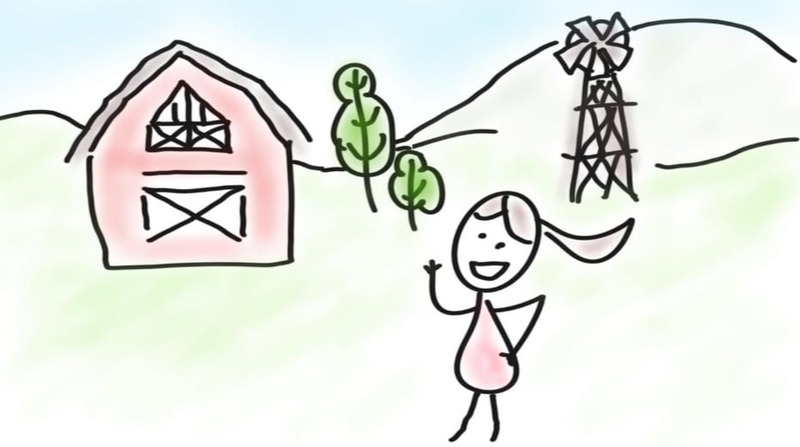 In Traveling Adventures of a Farm Girl, I share my stories which often focus on agricultural preservation and just basically having fun on the back roads. My oldest daughter (I have three children) is married and has two children. It is magical to spend as much time as I can with them. They grow up so fast that I try to make outings with them a priority, like a trip we took this past summer to Henry’s Rabbit Ranch! Looking back, you know, time with the grandkids is always so special. But our trip to Legoland last summer was really something else. As my grandkids get older I know that each trip, each outing, is more precious than the last because, while I hate to face it, eventually going with grandma will become passé. Boo hoo! I hate the thought, but it feels like it is still a bit down the line. Or at least I hope so! Anyhow, back to the trip. We traveled in August right before school was set to start back up. It would be a great end to the summer break. Since I was writing about the trip for my blog, Traveling Adventures of a Farm Girl and Senior News & Times, a regional paper out of Springfield, Illinois, the kids knew they had to let grandma take some pictures and get a few quotes for coverage, but otherwise, they were raring to go. Yeah, we are going on a trip! Part of the fun of the trip was telling the grandkids. They were ecstatic, especially my 6-year old grandson. As far as I can surmise, he is a LEGO expert. I mean, for years all he wanted LEGO this and LEGO that for every holiday. So I imagined a trip to LEGOLAND would be like Nirvana for the little guy. My granddaughter was eight at the time and she was excited as well. Extended holidays, travel and planning were her bailiwick. Promptly she was in the zone of deciding what to take, what she would wear, and so forth. The airport and flight on Frontier Airlines went smoothly. One word of advice though is that while the airline tickets were quite reasonable, all the extras (baggage check, seat selection, food, drink) are truly EXTRA, so be aware of this caveat when you make arrangements to fly with Frontier. 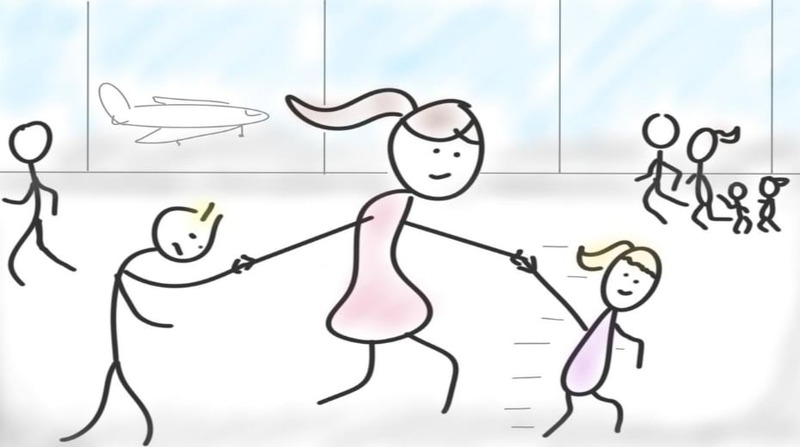 This was the first flight for the kids, except my granddaughter, who did fly as a baby. They were not scared, and they were actually quite excited. Honestly, the crowds at the airport were a bit overwhelming for these small-towners, but on the good side, the kids stuck close by our side. The hard aspect when going places with the two of them is my granddaughter does everything in lightening speed; in fact, my mom has given her the nickname of “White Lightening” both for her speed and her white blond hair. On the other hand, my grandson has one speed, S-L-O-W.
My daughter had planned ahead and brought plenty of things to occupy them on the plane. We arrived in Orlando, rented our car and then stopped for dinner at a cool place off the beaten path. 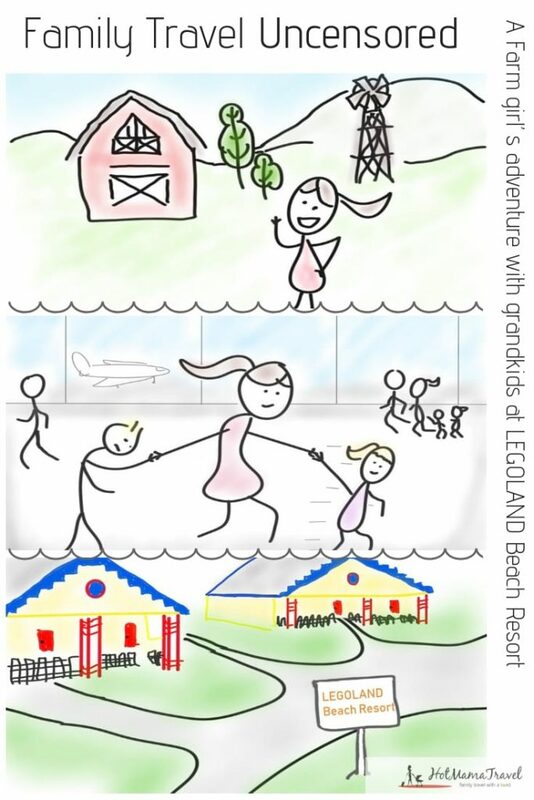 Then we were off to LEGOLAND Beach Resort! The resort was so colorful that it looked like something, well, out of LEGO (LAND). Rather than a regular check-in like a standard hotel, it was more like entering a National Park. It was actually impressive and a pretty cool experience. We drove up to a drive-thru and the check-in was completed through the window with a friendly LEGOLAND employee who assigned us our cottage. Each cottage is in a themed area. We were in Hula Girl, which I soon came to learn is one of the LEGO characters. The colorful cottages were in a circle-like enclave with a playground in the center. The cottage, with its kid-friendly environment, was clearly made with kids in mind and it was perfect for my grandchildren’s ages. While the cottage overall was small, it offered a big room for adults and was connected to a small room with bunk beds. There was also a neat little porch with table and chairs that we could hang out on. All meals were offered in a building next to the lovely Oasis Pool. All breakfast meals were free so we had fun eating cafeteria style. The grandkids loved the fact that there were French toast sticks available. My daughter and I liked the fact that there were some items that were not horribly caloric on the buffet as well. The second night we enjoyed a pizza at our cottage and sat out on the porch. While each cottage is in a neighborhood, the cottages are situated like planets rotating around the sun, which circle the pool, restaurant and communal building. It is here that all the resort activities are centered. The Communal Building is the heart of the resort, and inside there are LEGO character designs EVERYWHERE. You would really never even have to leave the resort with this amazing pool! We spent the first day enjoying the resort and the pool was a huge hit. In the water and around it are huge LEGO blocks floating in the pool. My grandkids created an array of LEGO structures while splashing and swimming around. The area also offers a gaming area with a spot to build a sand castle, a huge playground, and some interactive games. At the resort, they also have several life guards on hand that seemed very attentive to the children. They even play games with them offering some fun interaction. There are evening activities as well, and the Beach Retreat offered s‘mores in the evening for a nominal price. This was an option we thoroughly enjoyed on our second night there. While we could have ridden by trolley to nearby LEGOLAND theme park, we took our rented car so we were free to come and go. It wasn’t hard to get the kids to move because the excitement was over the top. 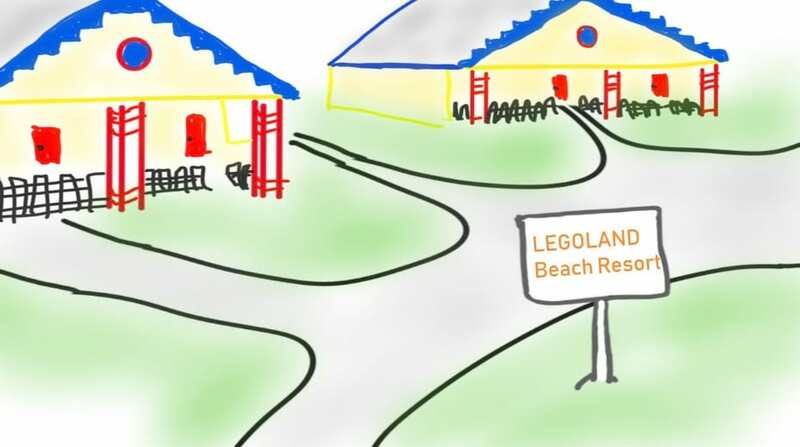 We parked next to the LEGOLAND Hotel which looked like fun; however, I was glad we had chosen the Beach Resort. The LEGOLAND park was pretty amazing. I knew this would be fun for the kids, but what I didn’t realize was that this grandma would have so much fun as well. My grandkids were the perfect ages at 6 and 8. The park is visibly designed for families with more than 45 rides, shows, attractions, restaurants, shops, a botanical garden, and a water park. 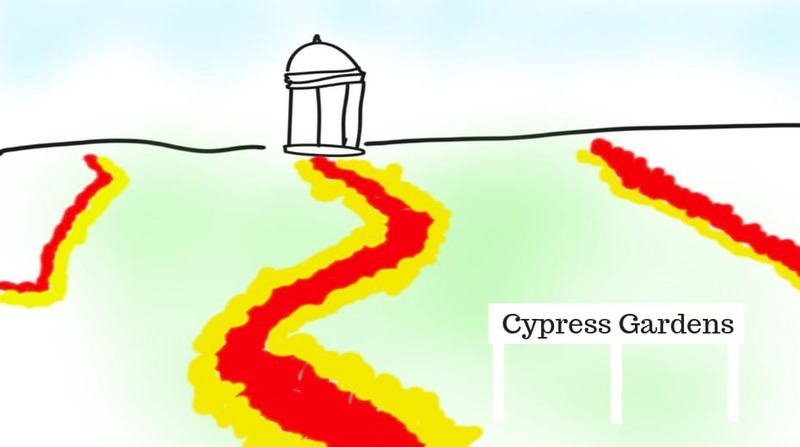 I never made it to Cypress Gardens when it was open, but coming to LEGOLAND, I got a glimpse of what it must have been like because the park is located on the former site of Cypress Gardens. Walking around and viewing some of the large trees and the water ski show you can still see some of the remnants of the former gardens. They preserved the botanical park which I loved. In my eyes, plants and flowers just make a place. At LEGOLAND they even re-decorated the Water Park and roller coasters along a LEGO theme. 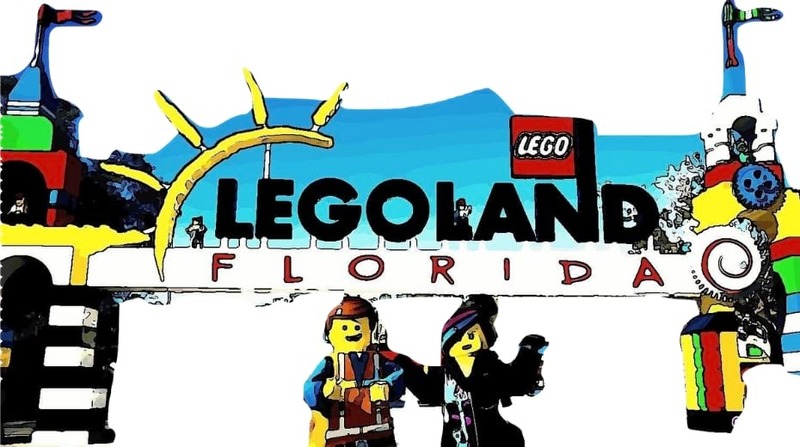 LEGOLAND Florida covers 145 acres, making it the second-largest LEGOLAND Park after LEGOLAND Windsor in the UK. On a fun note, my husband after he graduated from high school visited Cypress Gardens with his brothers. Somewhere in the family pictures is one with my husband and his brothers posing with a girl dressed as a southern belle at Cypress Gardens. Now this is just a quaint little piece of our own family history. We really only scheduled one day, at LEGOLAND and found that this was not enough for both the park and the water park. If we were going back again, I would definitely schedule another day for the water park. The kids wanted to take it all in and it rained during part of our stay, so the park was our choice. Our little expert knew all about the LEGO’s, even some of the history. When I wondered about that history out loud, my grandson already knew a little about the man that had invented LEGOs, Ole Kirk Christiansen. I love to hear about the history of places. That is my nerd alert coming out. My grandson had read a book about Christiansen in kindergarten. I looked him up and found that Christiansen was the founder of the Danish construction toy company the LEGO Group. Born in 1891 he was the 10th son of a poor family in Jutland, Denmark. A carpenter that lost his job during the Depression, he started creating wooden toys in 1932 to make a living. LEGOLAND has built its integrity on toys that can be “put together” and the park was no exception. Entering the park I was blown away by the creativity, architectural details and imagination that went into the sculptures at the park. LEGOLAND was clean, and offered an array of activities from rides, a water park, to a Discovery center and games. For those that like architecture, the focus may be LEGOLAND City. It was truly awe inspiring. I can’t believe with little blocks they can create such astounding characters and creations. During our visit we all had our favorite things from a dragon roller coaster, to movies, to the architecturally astounding LEGOLAND City and the pirate ski show. The grandkids posed with LEGO characters, played on a splash pad, rode rides, fought villains while on rides, ate, laughed and learned! Again, the two kids are quite different. My granddaughter is a thrill seeker and she wanted to go on the raging roller coasters, while my grandson was content to do splash pads and less exciting rides. That is why it is so perfect to have two adults so each child can indulge in their favorite activity and not miss anything or feel rushed. The best part of the trip though, was having a bit of time with my daughter and grandkids before school claimed them and immersed them in homework, sports and all the fall activities. LEGOLAND is a place where a kid can be a kid and, frankly, an adult can be a kid too! I learned a bit of interesting information about LEGO’s, but most of all, I learned more about my wonderful grandchildren and took full advantage of hugs, squeezes and fun. It was also wonderful to have some time with my busy daughter and hopefully I was able to help out, as traveling with kids can be quite a challenge. LEGOLAND was magical for all of us and I would go back again with my daughter and precious grandkids in a heartbeat. 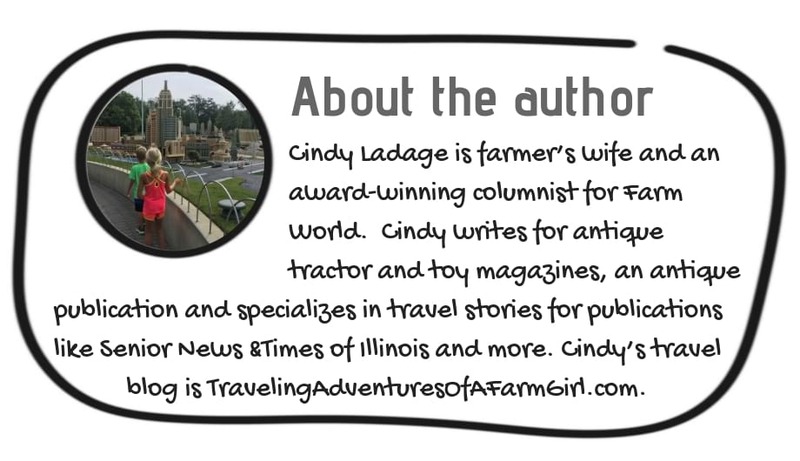 Read more from the author Cindy Ladage on her lovely blog Traveling Adventures of a Farm Girls. And don’t forget to follow Cindy on Twitter, Instagram, and Facebook.